‘The groups we take are typically 20 to 100 and we can provide anything they want such as ski instructors, a ski race, ice driving, meals on the mountain, conference facilities, athlete speakers, celebrity chefs and the like. 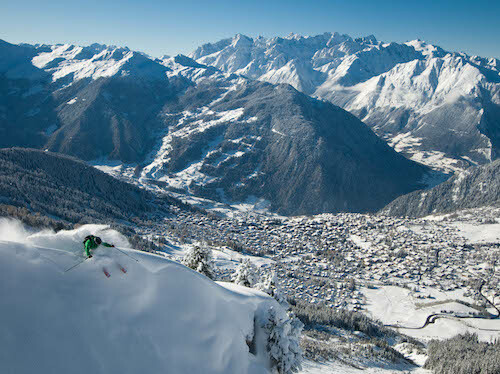 This season Momentum Ski is organizing a commercial property conference for 300 to 400 people in Courmayeur. The actual conference will be held in the brand new facilities, spectacularly set at 3462m at the top of the new Skyway revolving cable car up the Italian side of Mont Blanc. Among many other events, it is also organising an event for Aston Martin where participants get to drive the vehicles on an ice driving track. This season will be the 18th in which Momentum has organised the City Ski Championships which will be held in Verbier from 2 to 5 February 2017. They are now combined with the Financial Times Alpine Forum. The Forum is held at the 5-star W hotel after a welcome reception and networking dinner there; it is chaired by the FT and the focus is dependent on the panel members – last year’s focused on how the last 12 months would shape the next , with panellists Marcus Wareing, Frank Gardner, Marcus Brigstocke, Damon Hill and Peter Beardshaw (a risk specialist from Accenture). The debate was followed by a lively Q&A session. What price the 2017 session focusing on Brexit? Other celebrity guests invited to this season’s City Ski Championships include Amy Williams, Colin Jackson, Sir Steve Redgrave, Rufus Hound, Tommy Moe, Heston Blumenthal, former British Olympic ski racers Graham Bell and Konrad Bartelski and race commentator Matt Chilton. There’s après-ski organised by Ramknuckles with live music each afternoon and an Awards Dinner up the mountain at the Mouton Noir on the Saturday with a live band. With the City Ski Championships, two races are held on the Friday: the Virgin the Lodge Radar Trap Challenge (speed skiing) and the Accenture Dual Parallel Team Slalom. But the main event is the Saturday GS race, for skiers of all abilities. As well as a competition for teams from City and other business firms there is one for clubs such as the Lansdowne and Queens and non-business attendees. On both days there’ll be a race-side buffet and live commentary on the racing by the BBC’s Matt Chilton. Ski Weekend will have been going 30 years this season and pioneered short-break corporate ski trips back in the 1980s. About two-thirds of their business is to Chamonix and they know it like the back of their hand, with access to a huge range of accommodation, guides and instructors. For corporate, business and group travel, they organize everything, including their own ski courses, off-piste adventures and heli-skiing. They claim that their repeat and referral rates is among the highest in the business. Other activities they offer include: mini-Olympics on the mountain, dinners at private locations designed by a 3-Michelin-starred chef, skijoring, husky-sledding, a private charter train trip to dinner up the mountain in Chamonix, and a skidoo safari to a mountain refuge in Courmayeur for dinner. Doug Newman, Ski Weekend’s Sales and Marketing manager said ‘The philosophy for corporate travel is that anything is possible with Ski Weekend’. Ski Weekend also use a wide range of resorts other resorts across Europe and beyond, including Morzine, La Clusaz, Cortina, Gstaad, Vail (USA) and Niseko (Japan – where they took two long-weekend groups along with Chamonix instructors and mountain guides) and Iceland. Tony Steward of Alpine Weekends says, ‘We have worked with groups from 6 to 100, though the most frequent size is 20 to 30. And we can arrange events in any European resort but the most popular recent destinations include Morzine, Val Thorens, Chamonix, Alpe-d’Huez, Davos and Val d’Isère (where Alpine Weekends started up – as Weekends in Val d’Isère in the 1996/97 season).’ Their trips are usually accompanied by an Alpine Weekends rep and they often arrange special events such as dinner up the mountain, ice driving, wine tasting and floodlit skiing. Organizing a corporate trip yourself is a real hassle. People based in different areas of the country are likely to want to fly from different airports and at different times of day. And many hotels in the Alps don’t want to take bookings for just a few days, or to provide the number of single rooms that you might want. Numbers are likely to change as people drop out for various reasons. Your group is likely to have skiers and boarders of widely differing abilities and maybe some beginners or non-skiers, so you need to organize ski instructors or guides to lead different groups. You need to organize equipment (and maybe clothing) rental and lift passes. You might want to organize ‘jollies’ such as dinner up the mountain and a torchlit descent back or a lunchtime BBQ on the piste. And you might need rooms to hold business meetings in. But that’s what you use a tour operator or event organizer for – to deal with all the hassle and organize things on your behalf. And the great thing is that they don’t charge you any extra for doing all that – it’s part of the business to them. Because corporate trips tend to be short, you’ll want to keep the travel time to the minimum. Transfer times from airports to resorts generally range from one to four hours, and you’ll probably want to operate at the lower end of that range if you can. That’s why resorts such as Courmayeur in Italy and Chamonix in France (close to Geneva airport), Engelberg in Switzerland (close to Zürich), Kitzbühel in Austria (close to Salzburg and Innsbruck) and Garmisch in Germany (close to Munich) are popular. All these resorts have hotels that are happy to offer short-break bookings too.